It is with great sadness that we record the death of the ceramic artist, David Cohen. In 1976 he collaborated with his wife, Frances, to create ‘the Cohen panel,’ which commemorated the bicentenary of the Unitarian Universalist society in Edinburgh. The panel, which is in two parts, reaches from the platform to the sounding board . The lower section is ceramic and was crafted by David. It conveys the impression of underlying strata or a stone wall, with nooks and crannies for mosses, dried grasses and flowers. The upper section is a tapestry woven by Frances. It is of fields and hills extending upwards through the clouds. 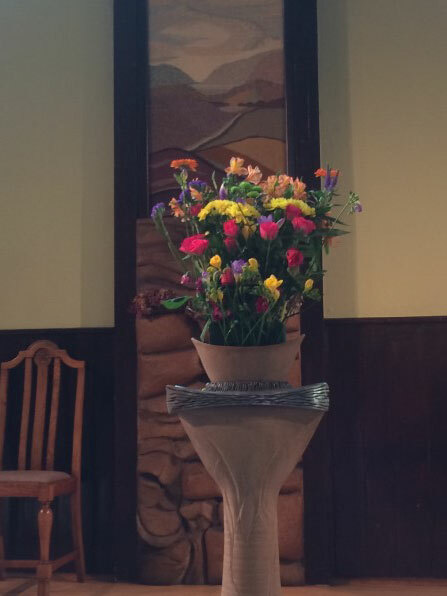 David also created the font and flowers pedestals that stand at the platform end of the sanctuary. The Cohen panel and pedestals were given to St Mark’s by Bob Sinclair, in memory of his first wife and of his daughter.